Somewhere in the fine print of the credit card agreement that most people sign with their banks is a clause that requires the person signing the agreement to consent to arbitration if any disputes arise between the consumer and the bank. This is known as the arbitration clause. This usually means that for example, if the person has complaints about extra hidden charges that are part of the credit card’s fees, or another issue concerning the terms of the credit agreement, the person cannot easily sue the bank to enforce his rights by filing a lawsuit. Arbitration is a form of dispute resolution where the parties with a dispute agree to present their issues to a neutral third party known as an arbitrator. The arbitrator listens to the evidence presented by each side, and then makes a final decision that is binding on both parties. The arbitrator is not a judge, and the arbitration does not generally take place in a courtroom. When a person signs an agreement agreeing to resolve disputes through arbitration as part of the credit card agreement, the person may also be agreeing to forego joining in any class action lawsuits against the bank. Banks prefer arbitration to class actions lawsuits from consumers because the bank is more likely to win through arbitration than in a class action lawsuit brought by multiple consumers. Recognizing the limitations that arbitration clauses stopping consumers from joining in class actions place on the consumers’ ability to hold banks and other such creditors accountable, the Bureau of Consumer Financial Protection has announced a new rule. 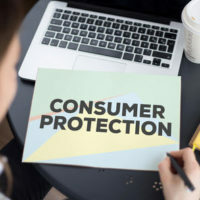 Under the new rule, consumers who enter into agreements with providers of consumer financial products and services shall not be prohibited from joining in class action lawsuits regarding the products and services offered. The rule does not take effect immediately, and applies to future consumer agreements. While the move has been celebrated as a long overdue protection for consumers, it has also been criticized as opening the way for abuse by consumers who want to file frivolous lawsuits. Because of this, there is already a move to try and block the rule by enacting legislation to repeal the rule. Often when consumers are wronged by a business or company, they may try to seek compensation by filing a lawsuit against the business. When the compensation at stake is relatively small however, the consumer may instead decide to take the loss, often because the cost of filing the lawsuit would be more than the compensation sought. However, in joining in a class action lawsuit against the bank, more consumers are able to share the cost of litigation, and in many receive more compensation from the bank. The power this rule gives to consumers is why it is important for this rule to remain in place. Unfortunately, we can only wait and see whether the rule will be repealed. Whether you are being charged additional fees for services you never signed up for, are a victim of predatory lending, or are battling with debt collectors who harassing you every day, you have rights that protect you are a consumer. Do not suffer any more abuse from debt collectors and overreaching creditors. Contact Louis S. Schwartz and his team at ConsumerLaw Pa.com.